touring wineries, exploring several cities and towns, eating in fine and interesting restaurants, and much more. Though I will have my laptop with me and have some access to email, my computer time will be limited. Thus my blog posting will be sporadic during the next couple weeks. Though when I return, I will have much to blog about. When I return, I will post all about my Spanish adventures, reviewing wines and restaurants, food markets and bars. I will have plenty of photos as well. My weekly column in the Stoneham Sun newspaper will continue to be published while I am away. And I may do a column on Spain upon my return. What new wines are coming out this fall? Well, I had a chance to find out. I was fortunate enough to have the opportunity to attend the Fall Portfolio Tasting of three wine distributors: Vineyard Road, Adonna Imports and Wine Nose. The tasting was held at The Elephant Walk in Boston, a French/Cambodian restaurant that is very good and well worth visiting. They have locations in Boston, Cambridge and Waltham. They provided the snacks at the tasting, from basic cheese and crackers to a few more exotic appetizers. There were about 150 wines available for tasting. I certainly did not taste all of them but did a fairly good sample of what was available, especially the reds. Overall, I was very pleased with what I tasted and think local wine stores may have some excellent choices this fall. I am going to list a number of the wines that I especially enjoyed at the tasting. These are some you might want to look for at your local wine store. In the near future, I might go into more detail about some of these wines. Before I start though, I wanted to talk again about wine distributors/importers. I have mentioned before that there are some wine distributors/importers that have an excellent reputation because they usually choose very good wines. So, if you find an unfamiliar wine, but are familiar with the distributor/importer, you might take a chance on it. I have talked about this before with Adonna Imports and their Italian wines. I may not like every Italian wine in their portfolio, but chances are that if I find an unfamiliar wine, I will enjoy it. The same applies with Vineyard Road. So, onto my list of recommendations. There were other good wines there too but I am only giving my preferred wines. I also am not mentioning those wines I have reviewed before. I have not listed prices as they only had wholesale prices. My most favorite wines of the tasting have been italicized. 2001 Orcella Destiny Ridge Vineyard "Orsus"
2005 Domaine Remizieres Crozes Hermitage "Christophe"
2005 Domaine Remizieres Hermitage "Emilie"
2005 Domaine Madeloc Collioure Rouge "Serral"
2005 Domaine Madeloc Collioure Rouge "Magenca"
2005 Domaine Madeloc Collioure Rouge "Crestal"
2006 Domaine Sarda Malet Cotes de Rousillon "Le Sarda"
2003 Domaine Sarda Malet Cotes de Rousillon "Terroir Mailloles"
2003 Cantina Convento Muri Gies Lagrein "Abtei Muri"
2005 Scholium Project Chardonnay "Nereides"
2005 Scholium Project Petite Sirah "Babylon"
My ultimate favorite of the tasting had to be the 2004 Espectacle S.L. Espectacle, Montsant. This is a very small production wine, about 500 cases. It is made from 100 year old Garnacha. The wine maker is Rene Barbier, Sr. The 2004 is their first release. It is an expensive wine but would stand up to any high end Priorat wine. I am used to the inexpensive Montsant wines, $10-15. This wine blew me away. It is a complex, powerhouse with a very long finish. I am sure that it is going to score quite well when it gets reviewed by the major critics. Some of these wines may be available at upcoming local tastings. If so, definitely give them a try. It looks like it is going to be a good season for new wines. I certainly have a list of wines that I will be seeking. Last evening, I attended the Northern Italian Wine Dinner at Savory Tastes Café. As usual, this was an excellent event with a bounty of food and wine. My family and friends also enjoyed it very much. Jeff and David of Ruby Wines were present, explaining all of the wines paired with the courses. And Chef Bell presided over the dinner, talking about the foods and making sure everything ran smoothly. Our first course was an Antipasti, a large plate for two that included Prosciutto, Soppressata, melon, olives (black and green), eggplant Caponata, white bean puree, roasted red peppers, cheeses, pesto and toasted bread. This was certainly a smorgasbord of flavors and textures. Everything was very fresh and we had almost nothing left on the plates when we were done. Paired with this course was the Borgo Magredo Prosecco, an Italian sparkling wine. Borgo Magredo is located in the Grave del Friuli appellation. Borgo Magredo is also the largest estate in Friuli. The wine is 100% Prosecco, estate grown and hand harvested. This wine has a mild carbonation, more a frizzante than the typical Champagne bubbles. It has some nice fruit flavors, like peach and other citrus. An interesting alternative to French Champagne and likely to appeal to those who do not like Champagne. We also got a large loaf of fresh Italian bread with dishes of spiced oil. We just tore chunks off the loaf and dunked them into the oil. The second course was Linguine with Clam Sauce, three steamed clams in open shells over linguine in clam juice, white wine and cayenne pepper. The clams were small and tender, and the sauce was mild and tasty. This was accompanied by the 2006 Falchini Vernaccia di San Gimignano "Solatio." This wine is 100% Vernaccia, estate bottled and single vineyard. It is lightly oaked and has a crisp, clean taste with nice green apples flavors. This was my favorite white wine of the evening. Our third course was Poached Salt Cod and Fennel, two pieces of salt cod in a fennel cream sauce and accompanied by two fennel hearts. This was a very tasty dish with a nice sauce. The salt cod was tender though it has a bit of springy texture, which is just its nature and not an error in the cooking. Its saltiness was mild and the wine helped to cut even that. Another good dish. With the salt cod, we had the 2006 Marchesi di Barolo Gavi "Le Lune." This is the only Gavi subjected to an arrested and non-malolactic secondary fermentation. The wine is made of 100% Cortese. It reminded me of a mellow Chardonnay, without all the oak. Though I thought it was ok, it did not thrill me. But then I am very particular on which white wines I enjoy. I am sure white wine aficionados would have enjoyed it very much. On to the wild game. The fourth courses, was Wild Boar with Parmesan Pignoli Risotto. This consisted of a couple thin slices of wild boar, tender and delicious, accompanied by a creamy risotto with pignoli and parmegiano reggiano. I definitely could have eaten plenty more of the boar. I also enjoyed the risotto. It had a nice creaminess to it and was cooked perfectly. Savory Taste definitely knows how to make good risotto. My favorite risotto though remains their smoked Gouda risotto. With the boar, we had a 2005 Fattoria Le Sorgenti Chianti Colli Fiorentini "Respiro." This is 100% Sangiovese that is fermented in stainless steel tanks and 40% of the wine then refines in barrique for 6 months. This was a fine example of a Chianti. It has nice cherry flavors and was very smooth. It made an excellent pair to the food. This is a wine worth seeking out. As a bit of a breather, there was then an Intermezzo of Peach Sorbet accompanied by a glass of 2006 DeForville Moscato d’Asti. The sorbet was delicious with a strong peach flavor and it went well with the slightly sweet Moscato. A nice palate cleanser as we geared up for the rest of our enjoyable meal. The fifth course was a bowl of Minestrone Soup, filled with lots of veggies, beans and potatoes. I don’t like Minestrone so I did not eat mine but those at my table who did liked it very much. The broth was very good as were all of the veggies. But I did enjoy the wine with this course, a 2006 Bastianich Rosato Colli Orientali del Friuli. This wine is made from 100% Refosco, an obscure red grape found in northern Italy. This was an excellent Rose, just a bit of sweetness and lots of lush fruit flavors like strawberry and raspberry. It is definitely a more Old World style and could compete with many French Roses. I do question though the pairing of a Rose with the minestrone. Just does not seem to me to pair well. But it is a wine I will seek out. Our sixth course was the Bisteca, a 5 oz. rib eye steak accompanied by creamy polenta and sauteed spinach and garlic finished with a beef au jus. Well, I did get mine without spinach as it is another veggie I am not keen on. The steak was thin, tender and flavorful with very little excess fat. Very good. The polenta was also tasty, a nice creamy, corn dish. For the Bisteca, the wine was the 1999 Salcheto Vino Nobile de Montepulciano "Salco Evoluzione. This wine is made from a local clone of Sangiovese called "Prugnolo Gentile," made from their oldest vineyards. The wine is wood aged for 27 months, then bottle refined for 10-12 months. This was a superb wine, a powerful red with an abundance of flavors, from black cherry to spice and leather. Just a perfect pairing for the steak. The wine had a nice lingering finish. My favorite red wine of the evening. Finally, our Dessert course. Can we really eat more food? Well, we did. The dessert was a Gelato and Balsamic Vinegar, scoops of vanilla bean and chocolate served with a reduced balsamic vinegar. A perfect ending to the meal. The ice cream was creamy and tasty and the balsamic vinegar was like a sweet syrup. Don’t think the taste of balsamic on salad as this was nothing like that. A satisfying ending to an excellent meal. Our final wine was the Casa alle Vacche Vin Santo del Chianti which is made from 90% Trebbiano Toscano and 10% Malvasia. It is a sweet wine that reminded me of a mild port. As I am not a big fan of port, I was not a big fan of this wine. Though those who did like port, enjoyed this sweet wine with their dessert. Overall, this was another fine wine dinner put on by Chef Bell. For the price, you cannot beat the value of all of these food courses plus eight different wines. Service was excellent, as usual. And everyone at the dinner seemed to be enjoying themselves. If you did not go, you missed out. So I definitely recommend you go to the next wine dinner. I know I will be there. With my Spanish vacation so near, I opted for a Spanish wine last evening to get me in the mood. And I decided to go for one of my newer acquisitions, a highly rated wine for which I have read much good press. But, would it meet those expectations? The 2004 Finca Villacreces Tinto, Ribera Del Duero ($38) is from an estate next to the famed Vega Sicilia. The Villacreces estate generally tries for a compromise between the old and new style wines of Ribera del Duero. Tinto Fino is related to Tempranillo though some experts claim there are significant differences between the two varietals, especially in older Tinto Fino. Traditionally, Tinto Fino is the primary varietal though winemakers have been adding some traditional Bordeaux varietals to their wines, especially for some additional structure to help them age. Jay Miller of the Wine Advocate awarded the wine 95 points and stated: "The 2004 Tinto is 86% Tempranillo, 10% Cabernet Sauvignon, and 4% Merlot fermented in barrel and aged in French oak for 16 months. Inky purple, it has an expressive bouquet of mocha/espresso, pain grille, graphite, wild blueberrys, and blackberry liqueur. This is followed by a full-bodied, full-flavored, plush wine with layers of spicy black fruits, impeccable balance, and a long, pure finish. The tannins are well concealed but this superb effort should evolve for 4-6 years and drink well through 2027." I found this wine to be quite dark in color, a rich purple. It is certainly a powerful wine, with strong flavors of dark berries and spice, as well as a touch of smoke. It is full-bodied and has a very long finish. The tannins are definitely there but do not overwhelm. This wine has a lot going on in it. There is much complexity to this wine. It is certainly a wine to savor. I very much enjoyed this wine. A strongly recommended Drink & Buy. So what did I pair with this wine? Pizza! Specifically, a meat lover's pizza with meatball, sausage, salami, ham, and bacon. Sure, this is not your usual pizza wine but I think it went well with all of the different meats. This is probably a wine for a nice steak but I certainly enjoyed it with the pizza too. My new column of "A Passionate Foodie" can be found in the September 26 issue of the Stoneham Sun newspaper. This is a weekly column that concentrates on reviews of local restaurants though it may also touch on a few other food and wine topics. The new column will be published tomorrow and is now available online. The new column is a restaurant review of Il Capriccio in Waltham, a creative Italian restaurant. This is definitely a place for excellent food and well worth a visit. You should also know that Jeannie Rogers, one of the restaurant's co-owners, also operates Adonna Imports, a wine importer/distributor company. Their portfolio contains primarily Italian wines, usually from small producers. Their wines are available in a number of local wine stores, including Grapevine Travelers, Wine Shop in Reading, OurGlass Wine Co. and Gordon's Fine Wine. I have tried a number of their wines and many of them were excellent values. You can find my reviews of some of their wines on my blog. Their wines are worth seeking out. Next week, my column will be more Wine Store recommendations. Does the Perfect Wine exist? If so, what would you be willing to pay for it? What risks would you take for that wine? Would you even risk death? Besides blogging, I enjoy writing fiction. I currently am working on a novel and have written numerous short stories. I have created a new site, A Passionate Foodie: Fiction, to showcase my original short stories that deal with food and wine. The debut short story is called "A Perfect Wine." It is about a man's quest for the Perfect Wine. Some might have read an earlier version of this story on the Real World Winer's site (which is now defunct). But, I have revised and expanded the story. I hope you enjoy the story and I would like to read your comments. Wine is certainly becoming a common ingredient in making all sorts of new food items. I recently posted about wine ice cream. Now, I want to bring your attention to wine infused salt. Thanks to Ryan over at Catavino for bringing this to my attention. Bodegas Abadia Reteurta, a Spanish winery, is now selling wine infused salt. Pascal Delbeck, who operates Selde Vin, a salt infused company, has developed some special wine infused salts for Abadia Reteurta. Pascual made a Tempranillo infused salt with Abadia's Pago Negralada and a Syrah infused salt from their Pago La Garduña. This certainly is an intriguing idea. The salts are currently available only at the winery. It comes in either a 3 ounce (4,50 Euros) or 11 ounce (12,50 Euros) bottle. The winery is currently running a recipe competition where you can win some of the salt. Check out the rules for the contest. Basically you need to come up with a recipe that would go well with either of their new wine infused salts. Abadia Reteurta is one of the wineries I will soon be visiting when I travel to Spain. So, I will be sure to pick up a couple bottles of the two salts so I can try them at home. One beneficial aspect of immigration is the introduction of new cuisines, ingredients and cooking styles. Innovative and creative chefs can create fusion dishes, combining the ingredients and cuisines of different cultures. If done well, this can lead to excellent and delicious dishes. Isabel Cruz is one such visionary and her new cookbook presents a fascinating fusion. Isabel’s Cantina: Bold Latin Flavors From The New California Kitchen ($27.00) by Isabel Cruz is published by Clarkson Potter/Publishers, an imprint of the Crown Publishing Group, a division of Random House. 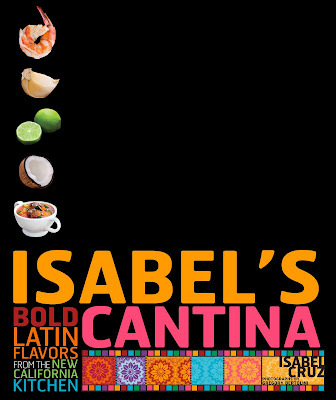 Isabel’s Cantina is a new hardcover cookbook with 224 pages. Isabel Cruz owns and operates five restaurants in California and Oregon, including Isabel’s Cantina, Coffee Cup, Seaside Cantina, Dragonfly and Isabel. Isabel grew up in a Puerto Rican family in Los Angeles, in a neighborhood with various other immigrants. She grew up with Latin foods but with an Asian influence. Thus, her cookbook reflects that fusion. In essence, her recipes are a combination of Puerto Rican, Cuban, Mexican, Japanese and Thai cooking. This fusion is very intriguing. An additional side benefit of this fusion is that the recipes have less fat than just Latin cooking. Isabel Cruz intentionally has tried to make her recipes healthy, but without sacrificing good taste. The cookbook is broken down into nine chapters including Starters; Salads; Soups; Main Courses; Rice, Beans and Other Sides; Salsas, Sauces, and Marinades; Desserts; Drinks; and Breakfasts. It contains over 110 recipes. Generally these recipes are easy to prepare, though a few of the recipes are of medium complexity. Most of the ingredients should be readily available in large grocery stores. The book does provide a Sources section listing where some of the less common ingredients can be found. There are a number of recipes that I would definitely like to try. These include such dishes as Spanish Chicken and Potato Soup, Sea Bass Steamed in Banana Leaves, Cumin Panko Chicken and Char-Grilled Rack of Lamb with Cinnamon and Cumin. The chapter of Salsas, Sauces, and Marinades seems particularly interesting and versatile. Her Soy Joy sauce sounds delicious, a mix of sweet and hot, and could be used in many different dishes. The Dessert chapter also is compelling. I love coconut so the Coconut Flan is very appealing. The Croissant Bread Pudding with Mexican Chocolate and Almonds also is appealing, especially looking at its photo. The Pina Colada Pancakes and Coconut French Toast sound delicious. The recipes, from appetizers to desserts, should appeal to a wide audience. About a third of the recipes have a brief “Isabel’s tip” which provides extra information on ingredients or cooking hints. There are also a fair share of color photos of the dishes. I feel that Isabel has fused the various cuisines quite well into her recipes. I recommend Isabel’s Cantina. It is easy to use, has plenty of intriguing recipes and is visually appealing. I first had this wine at a wine dinner at KroMel's, which is now Melissa's Main Street Bistro. I enjoyed it so much that the next day I went out to buy some of the wine. Buehler Vineyards is a small, family-owned winery located in the mountains east of St. Helena in Napa Valley. Their 2004 Buehler Vineyards Cabernet Sauvignon ($25) is 100% Cabernet Sauvignon. It is a very dark red in color with an intriguing sublte nose of dark berries. It is a smooth wine on the palate with moderate tannins on the finish, which make it better as a food wine. There are rich flavors of blackberries and maybe a little plum. There is also a touch of herb on the finish. At this price point, it is an excellent choice for a Cabernet. It is complex, balanced and delicious. It would go well with lamb, venison, or steaks. Buehler Vineyards makes two high-end Cabernets and I am going to seek those out as this wine impressed me. Recommended Drink & Buy. Mercer's Dairy, in Boonville, NY, makes all sorts of dairy products. They began making ice cream in 1952. They currently produce 36 flavors of ice cream, 8 flavors of yogurt, 4 flavors of sherbet, raspberry sorbet, and 3 flavors of fat-free, no-sugar-added ice cream. As well as wine ice cream. The wine ice cream currently is only available in limited areas, and not yet in Massachusetts. Mercer's though is seeking, or already has, licenses to sell their product in about 20 states. Some restaurants, in certain areas, now serve the ice cream. Certain grocery stores and wineries in New York, New Jersey and Missouri also sell the ice cream. It can also be ordered from the Ice Cream Cellar though they may only deliver in NY. Frost on the Vine is also a distributor for the wine ice cream in Missouri. The wine ice cream won "Best New Product" at the Great American Dessert Expo in June 2007. The idea certainly is intriguing. I have not had any of the ice cream so I can't say if it is any good. But I certainly would love to give it a try. Maybe the next time I travel to New York I will seek it out. If any of my readers have tried it, please tell give me your thoughts. Next Saturday, you might want to attend the Grand Fall Tasting at OurGlass Wine Co. in Saugus. About 30+ members of the North Shore Winers will attend the event so why not join them. The tasting should have around 70 or so wines, from many different countries and regions. There will be some Spanish wines, from Priorat and Rioja. There will also be some fine Italian and French wines. There will even be a Bordeaux table featuring the famed 2005 vintage, including some very affordable ones. Check out the great Organic wines available for tasting. They should have food as well to nibble on between your wine tastings. With that many wines, you definitely need something to cleanse your palate. I have been to their grand tastings before and they are always excellent. I ran a prior North Shore Winer event there and it went so well that many of the Winers will be attending this event. This is a great opportunity to check out many new wines. Poll #10 has now ended and the poll question was: Do You Enjoy Spanish Wines? There was nearly a tie between those who only enjoy Spanish red wines and those who enjoy both Spanish reds and whites. There was also a significant vote for those who want to know more about Spanish wines. So, it appears we should keep providing information on Spanish wines. You can also check out my friends at Catavino who have a huge site about Spanish and Portuguese wine. It also appears that Spanish whites may be underestimated. There are some great Spanish whites, such as Albarino and Godello. They are well worth trying. So, onto Poll #11. The question is: How Often Do You Attend Wine Tastings? Who Buys & Drinks More Wine, Men or Women? So, who is the bigger wino, men or women? Which gender buys more wine? Which gender drinks more wine? Is the answer the same to both questions? A recent report by Press-Enterprise addresses these questions as well as discussing some current marketing efforts based on the answers. The article cites the findings of the Wine Market Council. The Wine Market Council is a non-profit association of growers, wine producers, importers, wholesalers, and other affiliated businesses and organizations. Their mission is to establish the widespread acceptance of wine and to encourage the responsible enjoyment of wine. The Wine Market Council found that women purchase and drink 60% of the wine in the U.S. Obviously this is a very important statistic for wine retailers. And it is interesting in its own right as well. From my own experiences at wine tastings and wine stores, I definitely see more women than men. In my own wine event group, there are about 75% women. Why is this the case? What attracts more women to wine than men? Is wine not manly enough? Or is it something that may be changing now, that more and more men are getting into wine? It would be interesting to see the type of wines that women are buying. Is it mainly white wines? Do men buy & drink more red wines than women? The Press-Enterprise article also mentions the efforts of a couple wineries to create specific wines targeting women. Is that even necessary? Do women need wine that has been feminicized? I don't think so. Among wine bloggers, it seems that there are more men than women. Yet if more women are buying and drinking wine, then why aren't there more female bloggers? I have lots of questions in this area and few answers. But I think the questions deserve more study and contemplation. Maybe my readers can add their own comments and speculation to these questions. Yesterday, I and around fifteen members of the North Shore Winers attended the World Portfolio Wine Tasting at Corporate Wines in Woburn. We were not the only ones present. There were plenty of others who came to this event as well. There were 51 wines available at the tasting, whites and reds from a variety of countries and regions. The tasting was held in the back of the store, where all of their previous tastings have been. Two walls had tables of wine and the third wall had tables with food. There were platters of several cheeses and crackers, bruschetta, and chicken skewers. They kept replacing the platters all night when they were empty. With so many wines at the tasting, it was good to be able to cleanse your palate with the food. Corporate wines had an excellent discount as well for the evening. On the purchase of six bottles or more, you received a discount of 25% with either cash or credit card. That is certainly a generous and appealing discount. The store provided a list of the wines at the tasting though the list was a bit confusing. The wines were listed alphabetically by the winemaker and not broken down by each distributor's table. So, at each table, you had to hunt on the list of the wines you were tasting. The list also did not print the vintages of the wines. The list was the only real complaint I heard concerning the tasting. Here is my list of my favorite wines from the tasting. Please also note that these are only my personal favorites. There were other good wines at the tasting as well. 2005 Toso-Pascual Malbec from Mendoza, Argentina ($18.25): A powerful wine, full of smoke and spice. One of the best wines of the tasting. Legon Roble from Ribera del Duero, Spain ($14.25): Smooth, easy-drinking wine with cherry and vanilla flavors. Whistler GSM from Barossa, Australia ($20.25): Strong, spicy blend of Garnache, Syrah and Mourvedre. 2002 Warwick Three Cape Ladies from South Africa ($28.25): Interesting blend of Cabernet, Merlot and Pinotage. 2005 Chat Mourgues Rouge from De Nimes, France ($20.25): Subtle, Old World red that is similar to Rhone wines. 2003 Kiona Vineyard Lemberger from Red Mountain, Washington ($14.25): An unusual varietal which is a light, easy drinking wine with a touch of spice. 2004 Victor Hugo Opulence from Paso Robles, California ($28.25): Last weekend, I tried the Victor Hugo Hunchback in Waltham and it was one of my favorite wines at the tasting. The Opulence is another favorite. It is a Bordeaux blend with a nice complex melange of fruit and spice. A delicious wine! Victor Hugo Petite Sirah from Paso Robles, California ($20.25): Another fine effort by this winery. Such a dark, powerful and spicy wine. Give me a big steak! Another of the best wines of the tasting. Dievole Pinocchio Nero D'Avola from Sicily, Italy ($10.25): A lot of value in an inexpensive wine. A nice expression of this grape. Another of the best wines of the tasting because of its value. 2006 El Seque Monastrell from Alicante, Spain ($12.25): Monastrell is one of my favorite varietals and this wine does the grape much justice. Lots of fruit and character. A very good value wine. Corporate Wines will be having two more major tastings in the near future. On November 15 will be their Holiday Wine Tasting with over 50 wines. On December 13 will be their Champagne & Sparkling Wine tasting of over 25 wines. Sign up for their mailing list to keep updated on these and other tastings. Just a bit of an update on the new Nintendo DS Wine game. The company putting it out, Square-Enix, is most well known in the U.S. for making the Final Fantasy games. Their new wine game though will be called "Wine no Hajimekata DS" and they have an interesting advertisement on their site for the new game. In that advertisement, you can see some wine bottles in the background and they do not look like just Japanese wine. So, it appears the game will deal with imported wines too. There is another advertisement as well for a Culinary game too! I find the wine industry in China to be fascinating, especially as it is still in its relative infancy. It is interesting to see how it will develop. I previously discussed the state of the wine industry in China as well as ice wine in China. I have some more information to add on China and wine. I found a very informative website on wine in China, called the China Wines Information Website. If you want to know anything about wine in China, this website may have it. There is a section of News, info on wines imported into China, Chinese markets, laws, wine prices, and even a message board. This site is good for general knowledge or for wineries seeking to break into the Chinese markets. Wine & Nintendo is not an obvious pairing. But the Japanese seem to think they go together! Canoe has a new article mentioning that the Japanese have created a new Nintendo DS game that actually provides advice on wine. The game, called "Beginners Wine DS" will help teach how to taste wine, give notes on selecting wines, and more. It only comes with a database of 120 wines, which seems small compared to how many wines they could have placed into such a game. I also do not know what type of wines they include. Are they only Japanese wines or could they include imported wines as well. The game will be released on Nov. 15 to coincide with the release of Beaujolais Nouveau. There is no information about whether this game will be released in the U.S. or not. I think the game has possibilities but I think it should include far more wines and information. It certainly would bring wine to a larger audience though obviously it should not be marketed to underage people. Savory Tastes Cafe will soon hold another special wine dinner event. This time, it will be a Northern Italian wine dinner. This is their first event with this cuisine so I look forward to the results. I have been to many of their past wine dinners, and they have always been excellent as well as good values. I should be attending this wine dinner too. The dinner will be held on Wednesday, September 26th at 6:30 p.m. You will get a seven course dinner with Italian wine pairings provided by Ruby Wines. 6th course: Bisteca, a 5 oz. rib eye steak accompanied by creamy polenta and sauteed spinach and garlic finished with a beef au jus. Dessert: Gelato and Balsamic Vinegar "Italian Ice Cream", vanilla bean and chocolate served in a classic style with a reduced balsamic vinegar. The price for the event is $75.00 per person plus tax and gratuity. Call 781-942-8287 for reservations and beware that this event could fill up quickly. Bodegas Zabrin (Ateca) is a new joint venture between wine importer Jorge Ordoñez and the Gil family, winemakers, of the Jumilla region in Spain. The Gil family is most famed for their excellent Monastrell-based wines. Jorge has been at the forefront of many great wines imported from Spain. "Meticulously hand harvested clusters of fully matured Garnacha grapes were selected from only the finest hillside vineyards planted over 3,000 feet above sea level. These vineyards were planted in the last decades of the nineteenth and the first decade of the twentieth centuries. Over a hundred years ago the local growers knew that the combination of poor gravelly slate soils, high altitudes, and arid conditions produced the best grapes. The wine, Atteca, produced today upholds these long held beliefs. Deep rich blackberry flavors persist on a long supple finish and are highlighted by the vibrant shimmering claret color." The Atteca is made from 100% Old Vines Granacha Old Vines, 80-120 years, and is 14.5% alcohol. It has a dark red/purple coloring and a fruity nose. On the front palate, there is a rush of berry fruits, including raspberry and some blueberry. This led to a long finish with some spicy notes. It is a full bodied wine that fills your mouth with vibrant flavors. Its tannins are relatively mellow. I very much enjoyed this wine. It does seem more New World with its upfront fruit but it is definitely not one-dimensional. And at its price, it is a good value. Drink & Buy! This would be a good food wine too. It would probably go well with game like duck or venison. It might even go with steaks. It is a bigger wine so probably would not go as well with fish or even poultry. Though all depends on the specific recipe. In a previous post, I mentioned how Legal Sea Foods had revamped their wine program and lowered their wine prices. You can now read more about their program over at Boston Wine Buzz where Ken interviews Kara Kukull, the Sommelier at the Legal Sea Foods in Park Square. It is an interesting interview and you find out more of the wine bargains over at their restaurant. Check it out! This week's column of "A Passionate Foodie" can be found in the September 19 issue of the Stoneham Sun newspaper. This is a weekly column that concentrates on reviews of local restaurants though it may also touch on a few other food and wine topics. The new column will be published tomorrow and is now available online. The new column is a restaurant review about the Churrascaria Rodeo in Woburn, a Brazilian BBQ steakhouse. This is a feast for carnivores, all the grilled meat you can eat. Go for lunch or dinner. If you have any questions or comments about my column, feel free to add them here. Next week, my column will be a restaurant review of an Italian restaurant with creative cuisine. While checking out the sites of some fellow bloggers, I stopped at a photo that made my mouth water. Lenn, over at Lenndevours, posted about Cider Donuts! With the start of harvest season, apple picking has begun. And many of the local farms make apple cider donuts. I love them! They are simple treats but so very delicious. Especially when warm. I can't wait to drive to the local farms to pick up a dozen donuts. Thanks Lenn for reminding me of this great fall treasure. This Thursday, September 20, from 4:30-7:30pm, there will be a free World Portfolio Wine Tasting at Corporate Wines in Woburn. There will be about 70 wines available for tasting. There should also be some food to nibble on. On the purchase of six bottles or more, you will receive a discount of 15% (if you use a credit card) or 25% (if you use cash). I and others from the North Shore Winers will be attending this event. I have been to previous events at Corporate Wines and they have been good. So, stop by and try some wines! Dr. Vino has now posted the summary results of the 37th Wine Blogging Wednesday on Indigenous Varietals. My own submission was a Tannat. There were a total of 54 entries, a record amount. Check out the results! For WBW #38, Ryan and Gabriella over at Catavino have been handed the torch to choose the theme. After their concentration last month on the wines of Portugal, they have decided to continue their efforts and make it the theme for WBW #38. The theme is Portuguese Tables Wines With Caveats. The only real caveat is that you cannot choose Port or Madeira. They also provided a helpful cheat sheet on Portuguese wine, including a list of U.S. distributors. They have also provided some ways to earn bonus points. This should be an interesting WBW, providing a further insight into the Spain's Iberian companion. A couple days ago, I posted about how restaurant entrees are costing more and more, with some entrees costing over $40. In today's Boston Globe, in their Magazine, there is an article called Raw Deal which discusses the very same subject. The article lists many of the Boston restaurants with entrees over $40. Anthony Bourdain is quoted in the article, giving his own opinion of why Boston restaurants charge so much. And his opinion is not nice. He states: "They're reluctant to abandon their pomposity, expense, and pretense." I don't really agree with Anthony. I think it may be a bit of snobbery on his part, as he is biased in favor of New York. The article then goes on to examine whether the Rialto is justified in charging $43 for one of their steak dishes. And the writer does not seem convinced that it is worth that price. But the writer also feels other restaurants may be charging too much as well. Due to increased security in airports, it has become much more difficult to take wine home with you. You can no longer carry it onto the plane with you. It must be checked as luggage. This does make matters more burdensome. This becomes even harder when traveling overseas. At least domestically, you might be able to ship wine for a relatively reasonable cost. But when I soon go to Spain it will be very expensive to ship wine back home. It might cost $200-$300 to ship a case. If I want to bring wine back, I have to check it as luggage, which limits the amount I can bring home. Though things may be changing, at least a bit and at least domestically. You now can carry some wine onto the plane with you. Though it is very limited and I will explain. Vino Volo is a new chain of wine stores located at several U.S. airports. Currently they are located in Seattle, Sacramento, New York City, Baltimore and Washington D.C. More stores will open in the near future as well. Each store is also a bar and lounge. What is most interesting is that these stores are located past the security checkpoints. Thus, you can legally buy wine and carry it aboard with you. This would allow you hopefully to buy local wines and more conveniently take it onto the plane with you. Vino Volo also sells wine online, though only to a limited amount of states. They even have their own wine club. There is only a limited amount of wines listed on their website. Prices seem a little bit above average. It certainly would be good to see more wine stores like this at the airports, thus making it easy to transport wine. Yesterday afternoon, I and about fifteen members of the North Shore Winers attended the special "unusual" wine tasting at Gordons Fine Wine and Culinary Center in Waltham. There were plenty of other people at this event as well. It certainly seemed popular and with good reason. There were over 50 wines at the tasting, all either with uncommon varietals or uncommon blends. The tasting was held in a special back room of the wine store, an area where they have other tastings and food events. It made for a nice venue. There were also plates of varied cheeses, sausage, and slices of bread. Good to nibble on to cleanse your palate between wines. The wines we tasted were ones many people might ignore while shopping at a wine store. Who would pick up a Zweigelt or a Kotisfali if they had never tasted them before? Why risk the money to buy wines of which you know nothing about? That is why tastings like this are so important. They help teach people about all of the less common wines out there, and show them how good such wines can be. They open up their vistas to such a grander view. I know people at the tasting who bought wines they would not have bought save for this tasting. And now they know new varietals and may buy them again in the future as well. As well as tell their family and friends about their new finds. As I have often said, one of the best ways to learn about wine is to taste it. So, here is my list of my favorite wines from the tasting, listed by Distributor. Note that the prices are all 20% less than their standard retail as all of the wines were discounted for the event. Please also note that these are only my personal favorites. There were other good wines at the tasting as well. 2006 Bodegas Agapito Rico, Carchelo, Jumilla, Spain ($7.99)--100% Monastrell. Nice, fruity wine. One of my favorite varietals. 2006 Vevey Albert, Blanc de Morgex, Vallee d'Aoste, Italy ($17.99)--Excellent white wine, smooth and fruity. A definite crowd pleaser. 2003 Salzl, Zweigelt Barrique, Austria ($11.99)--Good red wine with fine fruit and mild oak flavoring. 2005 Mandino Cane, Dolceacqua Superiore "Arcagna," Rossesse, Liguria, Italy ($20.99)--One of the best wines at the tasting. Organic, light colored red wine but packed with complex flavors. Delicious lingering finish. Would pair well with food. NV Sokol Blosser, Evolution 11th ed, Dundee Hills, Oregon ($15.99)--A blend of 9 white varietals. I have had this wine before and it is very interesting. A tinge of sweetness and lots of fruit. Many of my friends enjoyed this as well. 2004 Allegrini, Palazzo Della Torre, IGT Veronese, Italy ($16.99)--A red blend of Corvina Veronese, Rondinella, and Sangiovese. A complex wine with intriguing fruit and spice. A nice long finish. Very delicious. 2005 Robert Foley, Charbono, Napa, California ($31.99)--Another of the best wines at the tasting. I have had this wine before, in older vintages, and always found it to be superb. Complex, excellent fruit, intriguing spice. Just an amazing wine. 2004 Lyriakis, Dafni, Crete, Greece ($12.99)--Dafni is the oldest recorded varietal still be used today. This was a very unusual white wine, reminding me of the taste of popcorn and burnt butter. All in a good way. I very much enjoyed this wine, especially as it is very different from the usual fruity whites. 2005 Dmn Madeloc, Collioure Blanc, France ($19.99)--Got to try the 2006 vintage and there was a significant difference between the two. Even just the one year of aging brought significant change. The 2006 was simple and fruity. The 2005 though was mellower, crisp and with more complex flavors. Excellent wine. 2006 Muri-Gries, Lagrein, Trentino-Alto Adige, Italy ($11.99)--Organic, low production wine made by a monastery. Great fruity nose with a smooth, delicious taste. Excellent value wine. 2000 Lidakis, Archanes, Crete, Greece ($15.99)--Another of the best wines at the tasting. Read my recent review of this wine. 2006 Montes, Cherub, Colchagua, Chile ($12.99)--An excellent Rose made from Syrah. Not too sweet, not too dry. Great choice for the remaining days of summer. Very delicious. 2004 Norton, Privada, Mendoza, Argentina ($15.99)--A blend of Cabernet, Malbec and Merlot. A very nice wine with good fruit and structure. 2005 Victor Hugo, the Hunchback, Paso Robles, California ($11.99)--Good blend of Merlot, Syrah, Petit Verdot and Malbec. Nice balance of fruit and spice. 2003 Bellum Providencia, Yecla, Spain ($12.99)--This is another of the best wines at the tasting. See my prior review of this wine. 2005 Trere, Pagadebit, Emilia-Romagna, Italy ($7.99)--An intriguing white wine with a bit of frizzante, a mild carbonation. Very refreshing wine. 2006 Maraglianco, Moscato, La Caliera, Asti, Italy ($10.99)--An excellent wine with a bit of effervesence. A little sweetness and also very refreshing. Great value wine. Kudos to Gordons and all of the Distributors for making this an excellent event. Gordons should be having their Grand Fall Tasting around October 27. I will provide more details when I get them. Just a reminder that today, from 1:00 pm - 4:00 pm, there will be a special, free wine tasting at Gordons Fine Wine and Culinary Center in Waltham. The wines, about 50 of them, will all have uncommon varietals or unusual blends. There will be a 20% discount on all of the wines at the tasting. I will be leading a group of the North Shore Winers to this event. We should have 20+ members there. So come on down and join us there. This should be an interesting event, to taste wines that you probably have never tasted before and might not buy on a lark. Gordon's has their own parking lot. They are also located close to many different restaurants in Waltham. They are located next to the excellent, high-end Italian restaurant, Il Capriccio. So make it day. Poll #9 has now ended and the poll question was: Do you enjoy dining at Brazilian Churrascaria Rodizios, the all-you-can-eat grilled meat steakhouses? An overwhelming amount of people, fifteen, voted in favor of these restaurants. Only one person did not like them and only one person had never been. For that person, I would strongly recommend checking out one of them. Especially if you enjoy grilled meats! So, onto Poll #10. As I will soon travel to Spain, let me choose a Spanish related question. So, the question is: Do You Enjoy Spanish Wines? How expensive can dinner get? A recent article in USA Today discussed the new entree costs. $40 entrees are becoming more common in restaurants all across the country. Prix-fixe menu prices are rising over $100 per person. And patrons do not seem to mind the high prices. Restaurant sales have increased 5.1% over 2006 and menu prices have risen 3.5%. For the higher prices, restaurants are providing high quality meats and seafood. How much are you willing to pay at a high-end restaurant? Is a $40 entree too extreme for you? How about a $100 mult-course meal? I think one needs to consider numerous factors when considering whether the price is appropriate or not. What is the quality and rarity of the food? What type of restaurant are you in? How much food do you receive? How is it prepared? What are similar restaurants charging? Another significant factor is your own love of food. If you are a foodie, if you have a true passion for eating, you are often willing to pay more for a fine meal. Others with passion are willing to pay more to fulfill their passion. And foodies are no different. I certainly am willing to pay for great food. How about you? I am at a loss for words. How do I properly describe my experience last evening? How do I do justice to the wines that I tasted? What words would be sufficient? Or is it something that can only be experienced? Last evening, I attended a Champagne Reception & Pre-Auction Wine Tasting at the Skinner Gallery in Boston. It was held in collaboration with Lower Falls Wine Co.. This was a two-hour event and what an event it turned out to be. You could start with a glass of Louis Roederer Brut Premier Champagne, a very nice wine without any overly yeasty taste. While you then meandered through the room, you would come across the primary wine table. It was here that you could taste 12 exceptional and expensive wines, spaced in three flights. So, how do I do justice to this exceptional wines? I find that I cannot. At best, I can sum these wines up as "Sublime." I admit I have little familiarity with such high-end wines. I don't have them stored in my wine cellar. They are a bit too expensive for me. But, I certainly can tell that they are outstanding wines. Even if I do not understand all of their nuances which someone who knows these wines well would. I was extremely pleased to have this opportunity. These are generally more subtle wines. You must pay attention to their complexities, savoring the ever-changing flavors. The long, lingering finishes. Each is different as well, varying in the amount of fruit, spice or tannins. I could try to explain each wine in the usual wine jargon, describing the different flavors and such. But that cannot present how these wines make you feel. It is something that generally cannot be conveyed in words. We tasted them under less than ideal conditions. We did not have a meal to accompany them where they could truly excel. Yet their quality shined though anyways. I must once again simply state it was Sublime. I am torn between the 1970 Mouton and the 2000 Lafite as my favorites. Just pure bliss. The only wine I did not care for was the 1974 Mondavi. It seemed too harsh, almost with a zoo smell. I am not usually a Port person, but enjoyed both Ports very much. They were smoother than the younger Ports I have had before. The aging certainly makes a significant difference. There was a table of cheese and breads to nibble on between tastes of wine. In addition, there was a short presentation by Andree Robert, co-owner of the renowned Maison Robert restaurant as well as Executive Chef. She spoke upon food pairings with older Bordeaux wines. It was an interesting and informative speech. Kudos must go out to Lower Falls Wine Co. for arranging another exceptional wine tasting. If you have never been to their store, then go. Sign up for their email newsletter as well so that you learn about their upcoming events. Remember as well that the wine auction will be held tomorrow, September 12, and starting at 6pm. The wine auction will be held at Skinner's offices at 63 Park Plaza, Boston, MA. Yes, it is a chain but I very much enjoy it! I have been to the McCormick & Schmick's Seafood Restaurant inside the Park Plaza hotel many times. I have also made a few visits to their Faneuil Hall location. They make up their menu twice a day, for lunch and dinner, based on what is fresh. The menu is mainly seafood though there are steak and poultry options as well. Lunch is a good value as the prices are usually half that of dinner, and meals are still fairly large. Tonight I stopped in for a quick dinner and sat at the bar. I chose the Red Tilapia with a cashew crust and Jamaican hot rum butter sauce ($19). This comes with rice pilaf and mixed veggies. I received a good sized piece of fish, moist and flaky. The crust and sauce is excellent, a sweet taste with crunchy nuts. They use this crust and sauce on other fishes as well, such as catfish. I have had it before and have always enjoyed it. Their fish is always fresh and delicious. I don't recall ever having a bad meal here. Give it a try at lunch when it is inexpensive. And I bet you return for dinner! After excellent visits to Clio and Toro, would my next trip to one of Chef Ken Oringer's restaurants be as good? With some trepidation, I did stop for lunch at KO Prime, Ken's new high end steakhouse. Why trepidation? I have read some mixed reviews on KO Prime, especially concerning service issues. Yet there have been good reviews as well. So I certainly was willing to give it a try. KO Prime is located in the Nine Zero Hotel on Tremont Street, not far from the Boston Common. You climb stairs to the second floor and encounter a bar area to the right, and the dining room straight ahead. The decor is modern with a few couches with a cowskin theme. The restaurant was fairly busy, especially with businessmen. It felt comfortable. I took a look at the wine list though I did not order anything, mainly as I would be attending a wine tasting later in the day. They have an interesting wine list, with some more different options though the list is a bit expensive. Wine by the glass starts at $10 and goes up from there. Prices are comparable to other high end steakhouses. The lunch menu includes appetizers, salads, sandwiches and some meals, usually smaller sized entrees. What to order to get a good sense of the restaurant? I figured maybe a couple appetizers might be in order. I started with the Wagyu Tartare ($19). This was served differently than usual. Instead of being mixed already, the diner is left to do so. The dish contained quite a sizeable mound of raw steak bits. One of the larger plates of tartare I have had before. You also get an egg yolk, held in an eggshell, as well as several different mixings, including onions, tomatoes, mustard and more. You also get several baguette slices to smear with the tartare. I very much enjoyed this dish. I did get an amuse bouche, a salmon ceviche with an Asian curry sauce. Delicious, with a nice creamy and spicy sauce. I then chose the Charcuterie ($12). I wanted to see how well they made these sausages and such. This dish came out on a long rectangular plate with six different types of charcuterie, tiny cornichon slices, two types of mustard, and slices of baguette. Again, a plate with plenty of food. The meats were all very different and delicious. From blue sausage to Vietnamese bologna. The only thing I did not eat was the head cheese. I just couldn't get myself to try it. Just FYI: Head cheese is not really cheese. It is a terrine made from the head of a calf or a pig. Though, as everything else was so good, I probably should have given even the head cheese a chance. Next, dessert! Carmelized chocolate bread pudding with pistachio ice cream ($10). Until recently, I had not been a fan of bread pudding. Too many of the old runny bread puddings with those black raisins. But, so many restaurants now are making some delicious bread puddings. When this pudding came out, it looked superb. A large square of a dark chocolate bread pudding, in a sea of creme fraiche, topped by a scoop of pistachio ice cream, and a thin chocolate cookie, and nuts. This was a fabulous dessert. The pudding was like a super-moist chocolate cake. Any chocolate lovers would swoon over this dish. Service was generally very good, except that I did have to ask for bread. Other than that, the waiter was attentive and personable. Overall, this was a very good experience. I got plenty of food, it was quite delicious and prices were reasonable for what I received. I will definitely return here to have dinner some evening. And to get the chocolate bread pudding again! Virtual wine tastings continue to gain in popularity. It certainly helps promote a sense of community among wine bloggers. And it can be a lot of fun. Today is the 37th Wine Blogging Wednesday. Originated by Lenn over Lenndevours, this may be one of the longest continuous series of Virtual Wine Tastings online. It certainly continus to grow in participation and popularity. Over 40 bloggers are likely to participate in this latest event. Dr. Vino actually chose the theme for today’s event. The theme is Indigenous Grape Varietals. This was certainly an easy theme for me as I love trying indigenous varietals from all sorts of different countries. I also had plenty of available options in my wine cellar. But which one would I choose? After much deliberation, I chose the Tannat varietal in a wine from Uruguay. Tannat has its origin in France, possibly in the Basque region. But is most closely connected to the Madiran region, at the foothills of the Pyrenees, though it is grown in a few other regions of France as well. But in the late 19th century, Basque immigrants brought Tannat to Uruguay. The varietal adapted well and has since become the national red grape of Uruguay. More Tannat is now grown in Uruguay than France. Of course the U.S. has tried their hands at Tannat though it was only in 2002 that it was actually recognized as a legal varietal in the U.S.
Tannat is an easy varietal to grow. It ripens late, is frost hardy and is a consistent producer. The grapes have thick skins which make them more resistant to powdery mildew and botrytis. About the only problem with growing Tannat is its thick stems which cling tightly to the grapes and can be tough to remove when needed at harvest. Tannat makes robust wines, with intense color, strong tannins and a spicy finish. It may be used alone or blended with Merlot, Cabernet Sauvignon or Cabernet Franc. The particular wine I chose was the 2002 Vinedos de los Vientos Tannat ($23). It is 100% Tannat and only has a 12.5% alcohol content. It has a bit of a rustic nose but with tinges of dark berry. It is very dark red in color. On the palate, there are many fruit flavors, like plum and blueberry. There are also traces of leather and smoke. The tannins are moderate though strong enough that food is needed to tame them a bit. The finish is long with some nice spice, more black pepper and clove. It definitely has a different element to its taste, something I cannot identify but which makes this a bit different from other wines. Though in a good way. I had this wine before, at least a year ago, and the additional aging seems to have mellowed its previously rustic taste. I think this wine would improve even more with continued aging. I paired this wine with a chicken curry dish over rice and I thought it went well. The hot spiciness of the dish did mellow out the tannins of the Tannat. The curry sauce was more creamy which I think contributed to the mellowing. I enjoyed the wine very much with this dinner. Overall, I consider this wine a Drink & Buy. It is something different and has a good taste. Give Tannat and Uruguay a try! When I visit Nova Scotia, I usually bring back some Canadian wine. I have previously visited several wineries in Nova Scotia. Last evening, I opened a wine I had picked up a couple years ago. It was the NV Jost Vineyards Cabernet Sauvignon Marechal Foch ($9). Jost Vineyards, which became a licensed winery in 1983, makes red, white, rose, fruit, and specialty wines. Their specialty wines include icewine, maple wines, raspberry wine and blueberry wine. Marechal Foch is a French-American hybrid. It was developed in Alsace by grape hybridizer, Eugene Kuhlmann. There is still a question though as to which grapes were used to make the hybrid. It may be a cross between a North American riparia-rupestris and a vinifera, Goldriesling. Others feel the North American grape is Oberlin Noir, a Gamay-riparia cross. The varietal was named after the French marshal Ferdinand Foch, who played a significant role in armistice negotiations in World War I.
Marechal Foch is an early-ripening grape and is hardy enough to endure cold-climates. Thus, it is popular in parts of Canada. Though some of the northern U.S. states also grow it. Some feel the grape is similar in tastes to Burgundy Pinot Noirs. I have had some single varietal Marechal Fochs and enjoyed them. The NV Jost Vineyards Cabernet Sauvignon Marechal Foch has a medium-red color and a dark cherry nose. It is a mild wine with very soft tannins. It has some interesting dark berry and cherry flavors with a short finish. It certainly does not remind me of most Cabernets. It reminds me instead more of an inexpensive Pinot. It does have some character, especially for a wine that is so inexpensive. I did like this wine and it went well with pizza. This is definitely an every day wine, easy drinking and with some character. A Drink & Buy. This week's column of "A Passionate Foodie" can be found in the September 12 issue of the Stoneham Sun newspaper. I write a weekly column that concentrates on reviews of local restaurants though it may also touch on a few other food and wine topics. This new column will be published tomorrow and is now available online. This column is a restaurant review about the Flatbread Company in Bedford, a restaurant that serves organic pizza and sundaes. It is a fun, casual and delicious place to dine. If you have any questions or comments about my column, feel free to add them here. Next week, my column will be a restaurant review of a Brazilian BBQ place. I am a fan of Anthony Bourdain (No Reservations) and Andrew Zimmerman (Bizarre Foods), very much enjoying their television shows on the Travel Channel. I am intrigued about all of the various places they visit, and all the local foods they eat. It provides a fascinating view into so many different cultures. When I travel to Spain, I will even visit some of the places that Andrew Zimmerman did in his show. So, while browsing at a local Barnes & Noble bookstore, I found The Year Of Eating Dangerously ($24.95) by Tom Parker Bowles. It is published by St. Martin's Press and is a hardcover book with 374 pages. Bowles is the son of Camilla Parker Bowles and he is a British food critic. Like Bourdain and Zimmerman, Bowles spent a year traveling the world and sampling foods in several different countries, including some bizarre and dangerous foods. The topic certainly intrigued me so I decided to buy it. The book is divided into nine chapters, broken down by his geographic visit. The chapters include Elvers (Britain), New Mexico, China, Nashville, Tokyo, Korea, Laos, Spain and Sicily. Bowles states his book is about his love of food and fascination with other cultures. He also wants to overcome preconceptions about strange and unusual foods, and just try to see them as food and not something to irrationally shun. I found this book to be completely fascinating. Bowles is an excellent writer and makes his travels very interesting. He provides intriguing histories about foods and regions. I can feel his strong passion for food. And he makes some very excellent points about food in general. I would definitely recommend this book to all foodies. I hope that Bowles writes additional books in this vein. Let's examine the book in a bit more detail, touching on each of the chapters. Chapter One: Elvers, is about baby eels and British fisherman who catch them. Bowles goes out at night with some of the fisherman to try to catch some of the elvers. As he does in the other chapters, Bowles provides a history lesson on eels, as well as a bit of biology. It is a fascinating history and I certainly learned more about eels. I have eaten elvers before, a Spanish delicacy. Though when I travel to Spain it will not be elver season. Chapter Two: New Mexico, is about a visit to the National Fiery Foods and Barbeque Show and the hunt for hot chilies. There is a history of chiles and a discussion of the Scoville Scale, which rates the heat levels of chiles and sauces. Bowles tastes some very hot sauces and enjoys the event. Another good chapter. Chapter Three: China, entails food in several different parts of China, including strange items like snake gall bladder in a glass of rice wine, stinky tofu and millipede. Bowles seems to have a food overload in China, eating far too much. Chapter Four: Nashville, discusses Bowles' work as a judge at the Annual Jack Daniels World Championship Invitational Barbeque. He talks about the history of barbeque, the excellent foods he gets to judge, as well a superb fried chicken from a local restaurant. Chapter Five: Tokyo, relates Bowles's efforts to taste the dangerous fugu. He actually gets to taste several different parts of the fugu, including fugu sperm. Chapter Six: Korea, may be the toughest trip for Bowles as he is on the quest to eat dog. Bowles has significant psychological issues about eating dog and it will plague him throughout his trip? Does he finally eat dog? You need to read this chapter to find out. Chapter Seven: Laos, may have been one of his best trips as he raves about much of their food. He eats many local, unusual dishes and he thoroughly enjoys most of them, including items like live shrimp salad, baby bees and ant egg salad. Chapter Eight: Spain, concentrates on Galician fisherman who risk their lives to collect goose neck barnacles. Bowles finds the barnacles to be delicious. I will have to keep an eye out for the barnacles when I am in Spain. Chapter Nine: Sicily, details a visit to the Italian island and touches on its connection to the Mafia, as well as the fine foods that can be found there. Within the book, Bowles does discuss some of the threats to our foods, such as fast food chains and the decreasing population of elvers. He supports local foods, but with rationality. And he supports local cuisines, hoping that they continue to maintain their strength within their regions. Buy this book, read it and enjoy! Finding an excellent Pinot Noir for under $25 is a difficult task. Good Pinots are getting more and more expensive. So, finding an inexpensive Pinot is a special treasure. And I have found such a treasure! Montinore Estate is a family-owned and operated winery in Oregon’s Willamette Valley. The winery was established in 1982 by two generations of the Marchesi family, Italian-Americans. The winery combines Old World wine-making techniques with learned biodynamic farming. Their vineyards contain primarily Pinot Noir, Pinot Gris, Gewurtztraminer, Riesling, and Muller-Thurgau. More than half their vineyards are Pinot Noir. They make several levels of Pinot Noir, with their vineyard-designated Pinots being at the pinnacle. The 2002 Montinore Estate Pierce's Elbow Pinot Noir ($20) is one of their higher end Pinots. Only 300 cases of this wine were made. This is a very light colored red wine with a cherry and strawberry nose. It is more Burgdunian in style, being lighter and more subtle. It has lots of complexity on the palate, a melange of well-integrated flavors with nothing overpowering. There is a very long, lingering finish. This wine has seen a little aging and seems to have gotten better from the last time I tasted it, over a year ago. For the price, this is a superb value Pinot, and I recommend it as a Drink & Buy. I have not had their later vintages, the 2006 being their latest release. I enjoy South African wines, especially their reds and my favorites are their Pinotages. Yet many local wine stores don't have a large selection of South African wines. I hope that more people start trying their wines and maybe then more stores will start selling them. The Business Report has a new article discussing the current status of wine exports from South Africa. In 2006, South Africa had a small decrease in exports but 2007 has seen an increase. The biggest market for their wines is currently the United Kingdom. Much of the article discusses their inroads into the UK. Exports to their other important markets, Sweden, Denmark and North America, have also been increasing as well. Let us hope this continues and our selection of South African wines continues to grow. As I reported before, the Midwest Grill of Inman Square in Cambridge is opening a branch in Saugus. I have confirmed now that it will be located on Rt.1 North, just past the Kowloon and Red Roof Inn. It is located in the same shopping plaza as Fuddruckers. It is on the corner, next to the road. Construction is still going on inside of the building. It certainly seems to be a good sized building. Plans are for the restaurant to open later this month. I very much look forward to their opening. This Friday, September 12, and starting at 6pm, Skinner will hold their first Fine Wine Auction in collaboration with Lower Falls Wine Co. The wine auction will be held at Skinner's offices at 63 Park Plaza, Boston, MA. Their wine catalogue is now available online. There are 216 lots up for auction. You will find Bordeaux and Burgundy, California Cabernet Sauvignon, Port, Champagne, Penfolds Grange, Italian wines, and Oregon Pinot Noir. The majority of lots are French wine. 9 bottles of 1982 Chateau Mouton Rothschild, valued at $6000-$9000. This wine was awarded 100 points by Robert Parker. 12 bottles of 1982 Chateau Lafite Rothschild, valued at $6000-$9000. This wine was awarded 100 points by Robert Parker. 6 bottles of 2002 Harlan Estate from California, valued at $4000-$6000. This wine was awarded 100 points by Robert Parker. A magnum of 1959 Château Lafite-Rothschild, valued at $6000-$8000. This wine was awarded 99 points by Robert Parker. The auction is open to the public and should be interesting to view, even if you might not purchase anything. I am likely to attend. Next Saturday, on September 15, from 1:00 pm - 4:00 pm, there will be a special and free wine tasting at Gordons Fine Wine and Culinary Center in Waltham. The wines will all have uncommon varietals or unusual blends. "Have you ever wondered what a Zweigelt is like? or a Lagrein? Have you even heard of these grapes? Or how about this for a blend: Riesling, Pinot Gris, Muller-Thurgau, Semillon, Gewurztraminer, Muscat, Pinot Blanc, Sylvaner, and Chardonnay? We will have a few less uncommon wines - Carmenere, Malbec, Valpolicella Ripassa, to name a few - but you won't find Cabernet Sauvignon unless it happens to be blended with Syrah, Charbono, and Zinfandel. So come and delight your palates with the unexpected and your wallets with a one day 20% discount on all 50 of the wines we are pouring." Recently, the local news has talked about numerous health violations at some of the best restaurants in Boston. No one likes to hear about rats running amok at night in restaurants. Yet what are your chances of getting food poisoning at a restaurant? MarketWatch just posted an intriguing article on this very subject. The article states there are about 76 million cases of food-borne illness in the U.S. each year. The severity of those cases varies from a mild discomfort to a more serious, life-threatening matter. Not all of those cases are attributable to restaurants. And of those that are, most are not related to large chain restaurants. Considering 18 major food scares in the last 25 years, only two involved chain trestaurants and one of those was actually the fault of a supplier. Why is this the case? Because chain restaurants have been instituting very strict protocols to prevent food illnesses. They work very hard to ensure the chain of food, from the farm to their store, maintains proper health safety procedures. So, though the threat does exist, maybe it is not as significant as people imagine. Poll #8 has now ended and the poll question was: How Often Do You Drink Wine? First place goes to Four to Five Times a Wweek, with 4 Votes. Second place was a tie, with 3 votes each, between Two to Three Times a Week and Everyday. What is interesting is that all of the voters drink wine more than once a week. So it definitely seems that wine lovers voted here. So, onto Poll #9. In keeping with the Brazilian theme, the question is: Do you enjoy dining at Brazilian Churrascaria Rodizios, the all-you-can-eat grilled meat steakhouses? As today is Brazil's Independence Day, let us continue the theme and discuss a couple Brazilian wines. As I mentioned in the Cachaca post, I dined last evening at the Churrascaria Rodeo. With dinner we had a couple Brazilian wines. You don't often see wines from Brazil at local wine stores so it was a treat to get to try a couple. The first wine was the 2004 Aurora Cellars Proprietary Red ($25). This is a red blend and I am unsure of the actual varietals. It does appear to retail for around $14, so its restaurant price would be less than double. This was a dark colored wine, with an intriguing taste. It had a full body with mild tannins. There were more dark berry flavors but with spicy undertones. This paired very well with all of the grilled meats we ate. I very much enjoyed this wine and would order it again. The second wine was the 2004 Brazilian Soul Cabernet Sauvignon ($21). This was a mild Cabernet, with mellow tannins and lots of bright fruit flavors, cherries and raspberries. It did go well with the grilled meats. It was a decent wine though nothing special. Today is Brazil's Independence Day. In honor of that day, I thought I would talk a little about Cachaça, the most popular distilled alcohol in Brazil. In addition, I actually tried Cachaça last night for the first time. Cachaça is distilled from fermented sugarcane juice. Though rum is also made from sugarcane, rum is usually made from molasses rather than the straight sugarcane juice. Cachaça's alcohol content ranges from 38-48% so it is a potent drink. This would translate into 76-96 proof, on average more potent than standard rums and vodkas. Though there are thousands of brands of Cachaça made in Brazil, very little is exported. Thus it is not easily found in the U.S. unless you go to regions frequented by Brazilians. Though this may be changing, especially with the popularity of artisanal liquors now. Cachaça may be either "white" or "dark." The white variety is unaged and it looks white, like a vodka. The dark variety has a gold or caramel color and has been aged in wood barrels. This is supposed to make it smoother and is often seen as the higher quality. Cachaça may be drank straight or in mixed drinks. The most famous drink made from Cachaça is the Caipirinha. This is made from Cachaça, limes, and sugar. Most Brazilians commonly refer to Cachaça as pinga, though there are many other names for it as well. Brazilians who drink straight Cachaça will often spill a few drops for the saints before drinking. The first shot of Cachaça may be referred to as the"guide" as it is the "one that clears the path and leads the way for all the shots that will certainly follow." Last evening, while dining at the Churrascaria Rodeo in Woburn, I tried a shot the Dona Beja Cachaça. It comes in a plastic container that resembles several sugar canes tied together. It was a white Cachaça. You definitely notice its power but it tasted very smooth, and a bit sweet. There was no bitter aftertaste or burning. It is definitely something that you could enjoy as long as you remembered its potency. My other friends, who also had shots, enjoyed it as well. Everyone commented on its smoothness. So, now I will have to keep an eye out for more Cachaça. Despite the fact that wine has been made in Greece for thousands of years, Greek wine still is hard to find in the U.S. and many wine lovers know little about it. Yet this is a tragedy as there are many excellent Greek wines that people would love to drink. It is worth taking a little extra effort to seek out Greek wines. An excellent resource on Greek wines is Greek Wine Makers, a site created by Nick Cobb. I have met Nick numerous times at wine tastings and he is passionate about wine. His site is filled with tons of information on Greek wines and is well worth checking out. Nick also works for a wine distributor, Vineyard Road, and they import some interesting Greek wines. This evening, I opened a bottle from their portfolio, the 2000 Lidakis Archanes. The 2000 Lidakis Archanes ($18) is a blend of 75% Kotsifali and 25% Mandilaria, both indigenous Greek varietals. You can find more information on these varietals here. The winemaker, Vangelis Lidakis, is from the Archanes region of Crete. This wine is named after that region. The wine is also biodynamic and a low production wine, only 300 cases. The Archanes is a deep red color, though a couple steps from being inky dark. The nose gives you some dried cherry smells which also comes out on the palate as well. The palate gives much dried fruit, cherry and cranberry. But there are some intriguing other flavors as well, an elusive taste that is hard to pinpoint. But which is very pleasing. It has some nice acidity, mild tannins and a lingering finish. It is well balanced and has a fair amount of complexity. For this price, and such a low production wine, this is an excellent value. I have had this wine before, and I think it has continued to improve with age. I strongly recommend this as a Drink & Buy. I paired this wine tonight with a garlic sausage and egg noodles, in a garlic/oil sauce. I think the pairing went well and the wine stood up to the strong flavors as well as the pork. This is a wine that would stand up to wild game as well. I could even picture this as a good BBQ wine. Thanks to a Chowhounds post for bringing my attention to a new restaurant opening in Burlington. Summer Winter, a new American restaurant, will open in October at the Burlington Marriot. It will be open for breakfast, lunch and dinner. The restaurant is a culinary collaboration between chefs Mark Gaier and Clark Frasier. Gaier and Fraiser are the chefs/owners of the renowned Arrows Restaurant located in Ogunquit, Maine. The menu is said to be a seasonal, modern American menu with fresh ingredients grown on-site. With the involvement of Gaier and Fraser, this new restaurant could be excellent. I will post more details when they become available. This week's column of "A Passionate Foodie" can be found in the September 5 issue of the Stoneham Sun newspaper. It may also be in newspapers in Reading, Medford, Saugus and Winchester. I write a weekly column that concentrates on reviews of local restaurants though it may also touch on a few other food and wine topics. This new column was published today and is available online as well. This column contains five wine store recommendations as well as information about some special wine tastings events that are scheduled for the near future. I am adding some supplementary information here about some of the wine stores mentioned in my article. As for OurGlass Wine Co., you can read more about the recent Italian red wine class and the Unusual White wine class. They are also having a special Sicilian wine dinner on September 22, at 6:30pm. Call them to make reservations. Courses will be paired with some exceptional Sicilian wines, like Nero D'Avola and Grillo. Cost is $75 per person which inc. tax and gratuity. As for The Spirited Gourmet, their new Belmont store, which will open this fall, will be located at 448 Common Street, Belmont. You might also be interested in my articles, Choosing a Wine Store and Recommended Wine Stores. If you have any questions or comments about my column, feel free to add them here. Next week, my column will be another restaurant review.